It has been two years since we have begun streaming full time as a content creator on twitch.tv/tangent and we have the Patreon community at large to thank for their crucial support in helping us get our foothold, especially for that first year. Now that we have established ourselves as stable and sustainable, we realize that there are a lot of production value assets to content creation that would greatly improve the quality of our streams, as well as allow us to budget more into our community as a whole. Because our community, stream and brand has grown and changed, so too have our goals and pledge rewards to better reflect our experience in the content creation field. Please mind our mess while we revamp this profile. At present, we perform on a rigorous streaming schedule - 7 days a week! It is a lot of work but I get a lot of fulfillment out of delivering consistent content. As you can imagine, especially with our chat token bots, having that much uptime on our PC's and machines that host our data and stream our games is very taxing on the hardware. In fact, many of our devices wear out from use in half the time it would if operated for normal consumer needs. Your support would allow us to have the capability to expeditiously replace broken hardware so that we have less downtime on the stream. With the additional funding that we receive through Patron support, we will invest in a multi stream setup, audio and visual on screen effects, props, and cameras that will enable us to take our production and quality to the next level. Please be aware that through content creation our bills and living expenses ARE paid for and we are not asking that kind of support. Because of our community, we already can do what we love and have a measure of comfort. This Patreon is for those who enjoy our content and would like a way to support the continued growth and advancement of our content creation. Thank you for considering our content to be worthy of your support! A buck's the minimum to get entered into our monthly drawing. 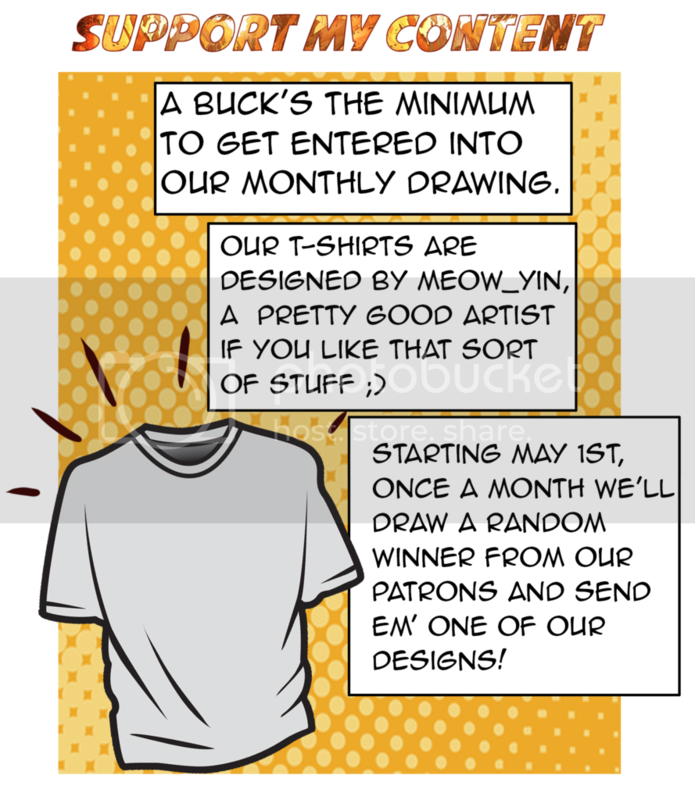 Our T-shirts are designed by Meow_Yin, a pretty good artist if you like that sort of stuff ;) Starting May 1st, Once a month we'll draw a random winner from our Patrons and send em' one of our designs! Entry into monthly T-Shirt Raffle! When needed, this funding would also be used to pay aspiring artists for animated intros, outros, and other animation tier assets for production.